Indian economy registered this decade's highest first quarter growth during the current financial year at 8.9 per cent on impressive showing by manufacturing and services sectors. However, Chidambaram wanted players other than industrial houses to chip in for boosting manufacturing growth further to make India a leader in at least 12 areas of activity. The finance minister attributed the robust GDP growth in first quarter to 31 per cent rise in bank credit, 36.2 per cent growth in commercial vehicles, 32.2 per cent increase in passenger traffic by aviation industry and 48.9 per cent jump in telephone connections. "Without government intervention," the services grew by 10.6 per cent in Q1 of the current fiscal, the finance minister said. 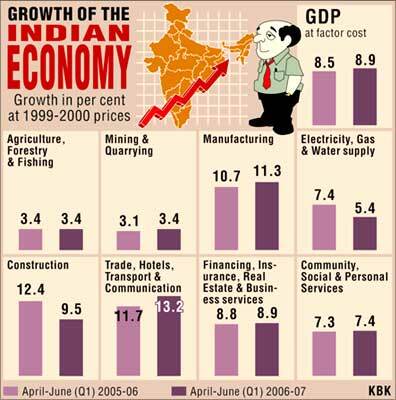 Agriculture grew by a flat 3.4 per cent, chipping in 19.1 per cent to overall GDP growth. Except for electricity and construction, which slowed down to 5.4 per cent and 9.5 per cent from 7.4 per cent and 12.4 per cent respectively, every sector recorded positive growth. The finance minister said growth in construction sector was lower than last year but did not indicate poor performance of the sector. "It was relatively less than last year. But 9.5 per cent on the base of 12.4 per cent is not a poor performance," he said. He said electricity has picked up in July and August, indicating that the sector is likely to exhibit good growth in the second quarter. Mining sector registered a growth of 3.4 per cent this fiscal compared to 3.1 per cent. Within services, trade, hotels, transport and communications grew by 13.2 per cent against 11.7 per cent, financing, insurance, real estate and business services were up marginally by 8.9 per cent against 8.8 per cent and community, social and personal services rose by 7.4 per cent from 7.3 per cent in the corresponding period of last year. In rupee terms, GDP at factor cost stood at Rs 656,064 crore (Rs 6,560.64 billion) in the first quarter this fiscal as against Rs 602,476 crore (Rs 6,024.76 billion) in April-June 2005-06. According to the Department of Agriculture and Coperation (DAC), the crops - rice, wheat, coarse cereals and pulses during the Rabi season (ended in June 2006) recorded growth rates of 19.3 per cent, 1.2 per cent, 8.0 per cent, and 0.5 per cent, respectively, over the corresponding season in the previous agriculture year. Finance Minister P Chidambaram on Friday avowed to take the reform process further in view of the political space having been generated by the sound macro economic situation with a hefty GDP growth rate of 8.9 per cent in Q1 of the current fiscal and moderation in inflation rate. The finance minister also allayed fears of a slippage in fiscal deficit and revenue deficit and expressed confidence that the government will be able to meet the fiscal deficit target for the year of 3.8 per cent and revenue deficit of 2.1 per cent. Addressing a press conference here to give his reflections on the GDP growth figures released here this morning, Chidambaram said inflation data indicates a rate of 4.52 per cent, which is lower than the figure of last week. "Inflation rate is moderating. The pressure point continues to be food prices. But I am confident that with supply augmentation of commodities like wheat and pulses, the demand-supply mismatch will be bridged. This will further lower the price level," he said. The reforms outlined by the finance minister which are high on the agenda of the United Progressive Alliance government relate to amendments to the legislations relating to the Banking Regulation Act, Pension Reforms and the Insurance Act. Chidambaram in particular expressed satisfaction at the robust manufacturing sector growth of 11.3 per cent in Q1 (first quarter of current fiscal) and said he would want to see India develop into a manufacturing hub with about a dozen industries taking a lead in this regard. He said capital expenditure of the industries -- small and medium enterprises(SME) as well as large industries needs to be stepped up to propel growth of the industrial sector. In this regard, he said he would be holding meetings with the concerned ministries and departments and industry representatives.